Himalayan Undyed is a collection of contemporary design rugs, handmade in Nepal with a long-established manufacture, in keeping the tradition and with a totally eco-friendly and natural management, to provide the opportunity of enjoying the beauty of real wool. Bartoli Design, inspired by the nature and the cultural tradition of those places, designed Terai, Lhotse, Annapurna and Wangden, for Nodus Rug – four models featuring marks reminiscent of the soil, the sand, the rocks, the customs and traditions of the Himalayan mountains. Thus, the story of the Himalayan Undyed starts on the Tibetan and Nepalese highlands, at 5000 meters above sea level, where flocks are reared by Nomads moving from place to place, among wide heights, never exceeding the natural carrying capacity of the land, the main food of the sheep being carex and other local bushes. That tipical high-altitude breed produces a distincive thick fleece that has a long staple, high tensile strength and is highly rich in lanoline and natural wax. A soft wool, which does not require conditioners; a 100% natural product with no need of genetic engineering, hormones, pesticides and moth proofing. All the Himalayan Undyed rugs are made with the Tibetan sheep’s natural colour wools, whose hues range from creamy white to browns to almost black. For all these reasons, the rugs are long-lasting and keep their beauty over time. After being collected from Nomads, the wool is sorted by hand and then washed in hot water, still leaving enough lanoline to create a soft product that retains more of the wool’s natural characteristics. In the same time wool is classified by natural colours, then carded and spun by hand with traditional tools and, if necessary during the spinning, soybean oil is used over the wheel. Different thicknesses of yarns can be spun for weaving the rugs: skilled craftsmen hand-knot the woollen yarn into a pure indian cotton warp fixed on a loom, with the help of an iron rod. 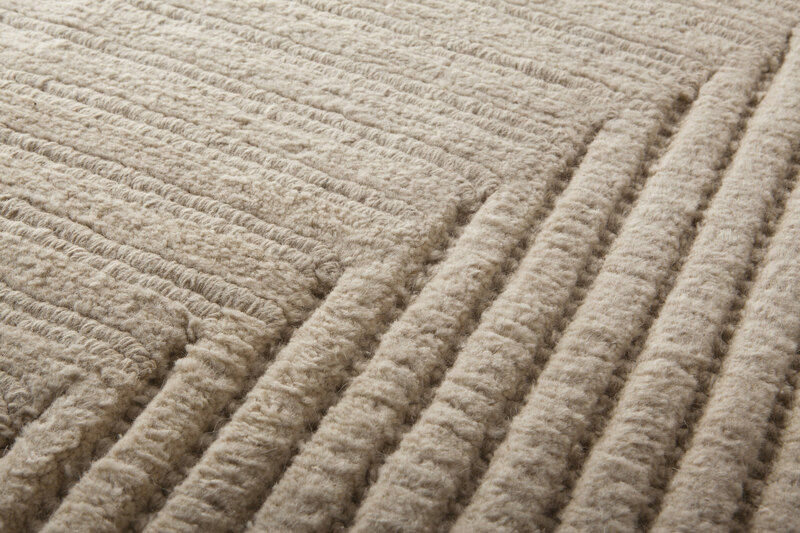 When the entire carpet is finally weaved, it is scissor-clipped to give the lively look and soft touch, then manually washed with water and liquid soap based on Sapindus (a plant used for the production of natural soaps) and stretched onto a frame after drying, to regain its specific dimensions. The carpet trimming and look are checked and a carved pattern may be created. The yarn waste of the weaving, trimming and carving processes is collected and used to make blakets, cushions and dunlops. During the whole process there’s no use of chemicals, environmental pollutants and substances that pose a health or safety hazard for workers or consumers; moreover, there are not flame retardants, as wool is naturally self-extinguishing As Bartoli Design explains: “It has been a full design experience, where the essence of the project arised from the essence of the material and the initial concept is completely identified with the final product. To seat or lie down on this wool makes you fully appreciate its naturalness, you can smell its scent”. 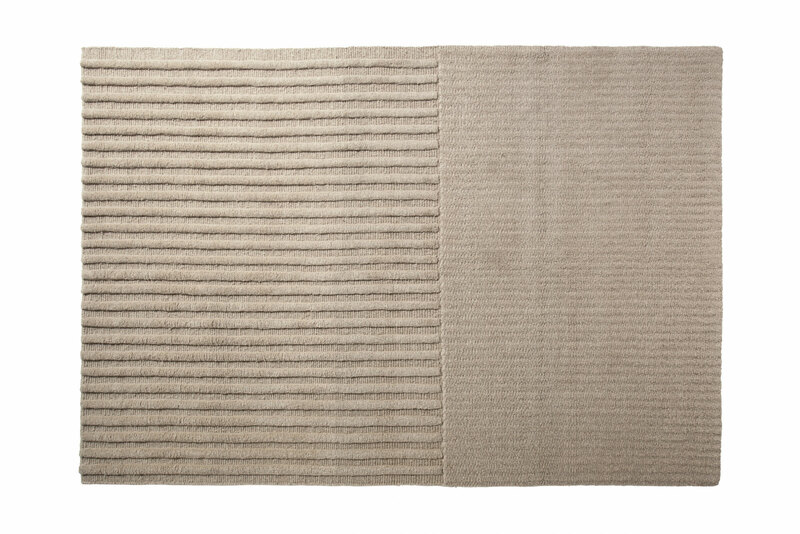 Terai shows the Himalayan undyed wools hues, from creamy white to dark brown, reminiscent of the soil shades. Wool has the texture of dug earth: the lines and shades of cultivated, ploughed lands inspired the original idea. The character of natural wool emerges in the textures and the deep crevices.